For the sake of practicality, size is the first factor to look at when choosing a dog. Some people adore small dogs and are scared of large ones. Some large-dog lovers couldn’t imagine sharing a home with the smaller breeds. Size doesn’t seem to matter as much to the dogs themselves as to the people who own them, so find out what size of dog suits you. The range of size in dogs is truly remarkable — think of the size difference between a Saint Bernard and a Teacup Poodle. And even within the same breed, size differences abound. 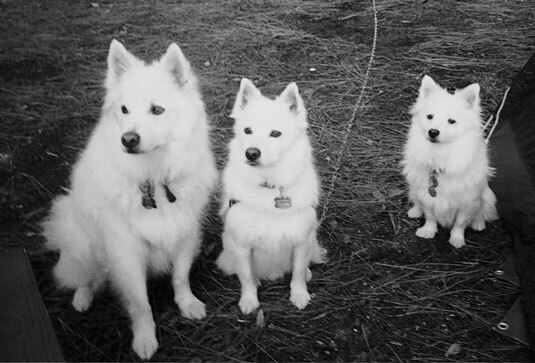 Note the size differences among dogs of the same American Eskimo breed. Large dogs are the perfect choice for active people: joggers, hikers, and cross-country skiers. Large dogs usually are not unduly sensitive to the ear-pulls and tail-grabs of children, and a solid pat on the ribs will not send them flying across the room. The downsides are that the larger the dog, the more it eats and the more poop-scooping you have to do. Big dogs can be more difficult to handle, more capable of destroying your home, more likely to inflict a serious injury should they decide to bite. Large dogs need more exercise than smaller ones, are harder to travel with and more expensive to kennel. If you don’t own your own home, you may find securing housing that accepts a large dog nearly impossible. They may be sneered at ay some, but a little dog who gets to go everywhere with his people, receives treats and pets just because he has the cutest little face, and fits easily on the smallest lap is living the best part of a dog’s life. Plus, you can give a small dog a bath in the kitchen sink, they eat miniscule amounts compared with larger dogs, and even a child’s short steps are a brisk trot for them, so exercise is easy. On the negative side, toy breeds can be yappy, and they are definitely fragile, which makes them unsuitable for homes with boisterous children. They have to be protected, too, from large dogs, some of which may consider a powder-puff dog as an appetizer.